I adore coconuts, I always did and I love coconut palms. I am lucky to have one on my property. Coconuts are so versatile and they can even be a life saver! They are really amazing, the coconut water is refeshing and very healthy, it’s rich in minerals like magnesium and manganese and B-vitamins. The coconut meat is high in fiber, fat and minerals, very nourishing and tasty. 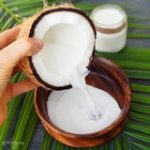 You will just need the coconut meat of one brown coconut and 3-4 cups of water to make my delicious homemade coconut milk recipe. You have to use the brown “mature” coconuts, not the young Thai coconuts. Put the meat of one brown coconut and 2-3 cups of water in your blender or food processor and blend for about 5 minutes. Use either a cheesecloth or a fine sieve to strain the milk. You can use the pulp in your muesli or bake a cake with it. That’s it, ready is your homemade and fresh coconut milk, without additives, without hormones, so easy and delicious. If you want a very rich and creamy coconut milk use 2 cups of water, otherwise use 3 cups. 1. Casein, which makes up 87% of cows milk protein, is the most significant carcinogen humans consume as per Dr. Colin Campbell. Check out his page for more information. 2. Milk is allowed to have a certain amount of red and also white pus cells in it (400 million pus cells in a litre). There are also pus cells in organic milk. 3. Dairy cows are impregnated against their will and carry their babies for 9 months. Baby calves are stolen from their mothers within hours of birth in order to maximize profit. Male calves are slaughtered early on in life for veal. 4. Cows don’t produce milk for human consumption. By all means, we are not baby calves. Humans are the only species who drink milk from another species and after they were weaned off. But milk contains Calcium right? 5. Like all animal protein, milk acidifies the body pH. Calcium is an excellent acid neutralizer, moreover our bones are the main storage site of calcium in the body. This calcium can neutralize the acidifying effect of milk. As soon as calcium is pulled out of the bones, it leaves the body via the urine and consequently there is a calcium deficit. 6. Organic milk and other animal products contain artery-clogging saturated fat and furthermore cholesterol, just like conventional animal products. 7. Milk and dairy products contain inflammatory substances and furthermore growth hormones that clog your pores and cause acne, psoriasis, eczema, and dermatitis. Do you want to lose weight? Ditch dairy! 8. The high saturated fat content in milk makes losing weight difficult. In addition, dairy products all contain varying amounts of lactose (milk sugar), and the protein in milk generates an insulin response, both of which hinder weight loss. 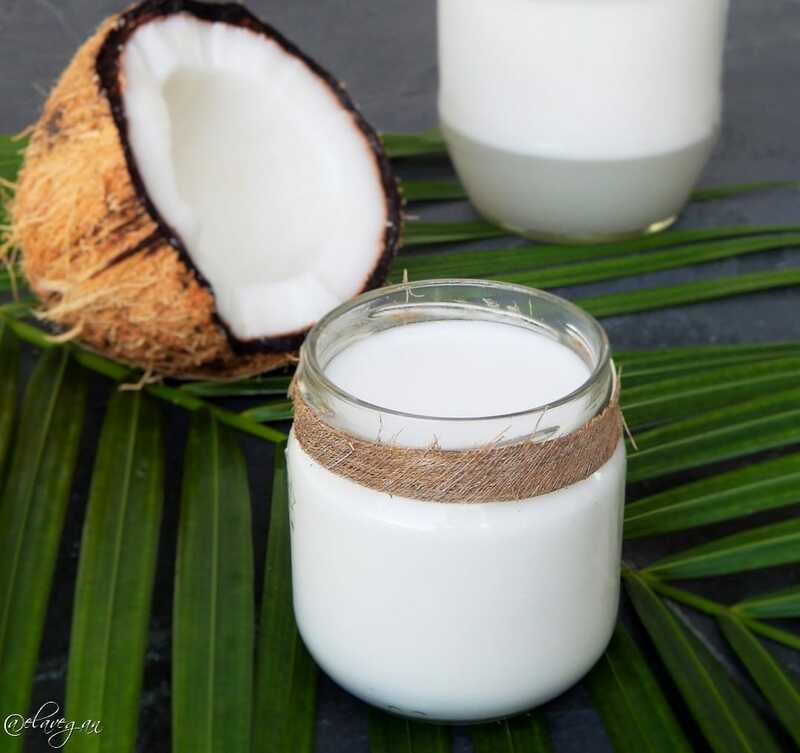 There is no reason to consume dairy since there are so many healthy and cruelty free alternatives like this homemade coconut milk recipe or almond milk, oat milk and many more. This white color is so pure,:) it seems so easy to make and it’s healthy. For the cow milk, I stopped it years ago because i didn’t like the taste and i knew it was not good for our body and now, i know it’s awful for cows. Thank you for posting this recipe! Reminds me of my grandma that used to make coconut milk from scratch. Definitely making this and many more recipes from your gorgeous blog!! Ela you are so creative and amazing ???? Love you lots and wish you the best my dear amiga!! Thanks a lot for this coconut milk recipe 🙂 I have been thinking about preparing it myself (I do prepare my own nut milk every time) for a while, but now it seems I have to give it a try. Just have to work out how to open a coconut ???? Thanks for this Ella, would love to see how to make coconut cooking oil too. Ela you have a blog now!!!!!!!!!!!!!!!!!! Ahhh this is just so freaking exciting that I am here commenting on your blog, I love it! And you already have it loaded up with so many beautiful and delicious recipes too, I am impressed! Congrats girl, and I cannot wait to see more and connect with you not just on IG 🙂 Much love! This is such a great post Ela! I’m so glad to read all about the reasons not to eat daily along side a great recipe for a diary alternative. Well done!! And your blog is beautiful. I’m so in love in natur and this page is celebrating in all their beauty. Thanks so much??? ?